Now that I had a finished box, I needed to make it pretty! 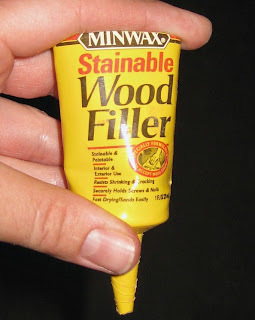 I chose Minwax's 'Provincial 211' as the color to stain it. I completed the process by spraying a polyurethane top coat in gloss. I like to use the spray can version to get even coverage and avoid brush strokes. I decided to use hinges because I knew my kids would never replace the lid after retrieving/returning a blanket back to the ottoman. After many failed attempts of trying to hold the lid, hinges, and box in place while drilling the screws in by myself...my dear friend came over to help hold everything while I drilled! What a lifesaver! We have our selves a very functional, beautiful storage box to hold our blankets in our family room! i like it better this way then the orignal...Very nice job. It turned out great..love the storage too!